Here we are at the All-Star break and the Cubs lone participating player is shortstop Starlin Castro who just turned 21 years old a few months ago during spring training. So young, so talented, and hopefully, a cornerstone to brighter days in the Cubs future. I’ve been thinking, and maybe it’s because of Castro’s age or because I’ve been working long hours on Boys of Spring – The Movie, but the speed at which life blows by is sometimes startling. Not the first half of the Cubs season mind you, that seemed to go on at a painstakingly slower pace. 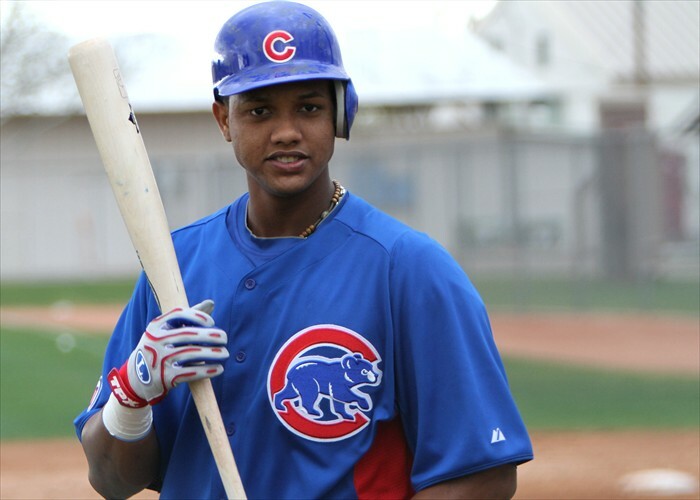 In the spring of 2010 I was blogging about a prodigy in Cubs camp, a 19 year old named Starlin who had finished the prior season at double A ball. One of my great pleasures of being involved with spring training is getting to see stars on the rise like Castro before they ever take a first swing in the major leagues. This brings to mind a scene in the Boys of Spring documentary which was shot in March of 1998, although it seems like yesterday to me. Sitting in the Hohokam stands was then Cubs president Andy MacPhail, relatively new to the team and still idealistic about turning around the Cubs. The BOS cameras caught the usually stoic MacPhail talking excitedly to someone about a Cubs prospect, a certain young hard throwing pitcher from Texas. Less than two months later that prospect struck out 20 Houston Astros in one game on his way to throwing one-hit shutout for the Cubs. The prodigy of course was a 20 year old Kerry Wood. And time moves on. This Boys of Spring – The Movie project has been ongoing for so long and become such a huge part of my life that it has now become a quest, a quest to finish this film and get it out to all my fellow Cubs and baseball fans. 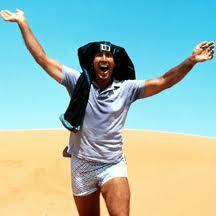 What was it Chicagoan Clark Griswold said about a quest? Never mind, better keep this PG. Some of you will remember me blogging about our film here several years ago; then I stopped, figuring when the film was nearing completion I would let you all know. We are nearing completion but we need help to finish it and do it right. A little back-story, a few years ago I had someone who wanted to Executive Produce the movie and was very excited about it and loved the whole concept. They had experience in the film biz with several films to their name.We went through a long process (nearly two years) that sadly ended with us not being able to agree on contracts. This is what led me to Kickstarter to help complete the documentary. We are still looking for corporate sponsorship as well, so please contact us if you have interest and we’ll send you our sponsor info. An interesting thing happened while I have been filming the BOS documentary, many other Cubs documentaries have started, been completed, and gone on their way. Several of those films followed the team during one season and looked for the ultimate payoff with the Cubs winning a World Series. When you follow a team during a certain year and that season ends with disappointment, I believe it makes it more difficult for Cubs fans to watch. And when you’re watching players talking about “that season” and they are no longer on the team it’s a bit disconcerting. That is in part what makes the BOS film so different, it’s not about one year, or how we are almost there but fall short, or what will happen when the Cubs win it all (I think we all pretty much know). Instead BOS spans time, covering different generations of Cubs teams – From Sandberg, to Sosa, to Soriano, to Starlin. We don’t just show these players or teams in a historical “looking back” piece, we taped and documented at the time it was happening. One thing that isn’t mentioned on the Kickstarter website (because it’s for creative projects and not charitable fund raising) is that a portion of each DVD sale (once the film is complete) will go to Ron Santo’s cause – The Juvenile Diabetes Research Foundation (JDRF). We will also be donating and helping to raise awareness for several other great causes, including the Alzheimer’s Association, and Cubs players foundation’s such as the Ryan Dempster Family Foundation. Tomorrow morning I’m flying to Chicago with the Mesa Hohokams on their annual business trip and through their courtesy I’ll be at Wrigley for games on Thursday and Friday. Because of this I may have the opportunity to talk about Boys of Spring – The Movie with some of the Cubs management and possibly the Ricketts. The past Cubs ownership knew of my documentary and helped facilitate it’s progress, I don’t think the new ownership knows of the film. So this is my chance to hopefully get the new Cubs owners on board with the BOS movie – Wish me luck! I’ll also try and do some blogging, tweeting, and photo uploading while I’m there to give you the skinny on this Chi-Town adventure. Enjoy the All-Star game, go Castro! Please check out our Boys of Spring film trailer here and help us get this one of a kind Cubs film made.